Luke’s birth story began when my husband went to chiropractic school. We were still engaged at the time, but I can remember him telling me, “When we have kids, we shouldn’t have them in a hospital,” and I thought he had lost his mind! Where else would a baby be born?! When my husband’s brother and his wife got pregnant and used a midwife and a birth center, I was impressed with the process, so I told my husband I would at least look into it when the time came, but that I wanted to interview a midwife in a hospital too. Fast-forward a year later, and we found ourselves pregnant. I stuck to my resolution to check out birth centers, but I was sure this hospital midwife I had found would be “it.” When she tried to talk me into a c-section during our consultation, I knew I was in the wrong place. After searching for other midwives in the Dallas/Fort Worth area and a visit to Lifetime Family Wellness Center, we found All About Babies Birth Center and Christy Martin CPM, LM. I can distinctly remember our interview with her: I had never met this woman, yet I cried because I felt like God led us to the right place. I went home and told my husband about this “missing piece.” I told him that this baby wasn’t going to come until we both surrendered. He told me that he agreed, but that he didn’t necessarily want to surrender to the idea of a hospital birth. I asked if I could pray for him, since my friends had prayed for me. So we lay in our bed, and I prayed that God would soften Andrew’s heart to His plan. When I finished praying, Andrew said he felt better about the idea, and he would be open to however this baby was supposed to arrive. I rolled over in the bed, and my water broke (it was 10:40 pm)! GOD IS SO GREAT! My contractions started about 30 minutes later; a minute long, 5 minutes apart. Thirty minutes after that, they were still a minute long and only 2.5 minutes apart. (This should have been a forewarning of Luke’s intense attitude about life!) We called our doula, Tonya Buffington, and she came to our house to help us labor. My version of the story says that we were at our house for about 45 minutes after our doula came. I later learned we were there for about 4 hours—I was definitely in my own time zone! I kept telling my husband and doula that I didn’t think I could get in the car and drive 35 minutes to the birth center. Our doula Tonya reassured me that I could do it. As it turns out, the car ride was one of my favorite parts of labor because my contractions slowed and I was able to rest a little (although next time, we are definitely doing a home birth—no questions asked!). When we got to the birth center, our birth team was waiting for us. Christy did an internal check (this was only the second internal check I had during our pregnancy), but I didn’t want to know how far along I was (because if she said I was only 2cm, I was going to be so disappointed!). I found days later that I was 6cm when we arrived, but the baby’s head was slightly cocked to one side (asynclitic). I wanted to scream at this baby, “C’mon, baby! You are a chiro-baby! Get yourself in the right position! !” Luckily Christy instructed my husband on how to do what he calls “the hardest wall-sits I’ve ever done” to help me re-position the baby’s head (this was the only part of labor that I recall being extremely painful, and it only lasted for 10 contractions). After that I labored in the tub for what I thought was 30 minutes (again, I later learned it was about 2 hours). 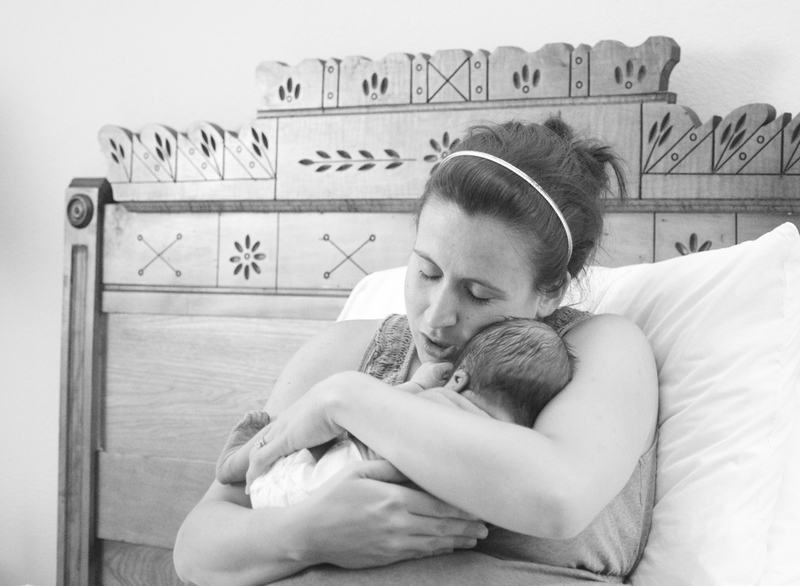 I remember my doula telling me that our birth photographer, Evie Bishop, arrived. (As a side note, I really struggled with whether or not I wanted a photographer at our birth... initially the idea felt strange. Later I realized that no one could have captured such an amazing moment in such a beautiful light! I am SO thankful that we have these images now!) I thought, “I must be doing well and getting close because they wouldn’t call her if I wasn’t!! !” (This was the only signal that I had for how dilated I was because I had asked to limit internal checks and that no one report my progress to me after these checks.) Soon after I got out of the tub, Christy checked me again and told me it was time to push. I remember feeling so in-tune with my body; I knew exactly what to do! At one point, my baby’s heart rate started to drop, but I listened to my birth team, and I didn’t panic because they didn’t either. After a change in positions and some oxygen, we were good to go again, and my husband got into position to catch. (Yes, my husband caught our baby!) I remember an intense stretching feeling followed by relief, and then at 7:49 am, just over 8 hours after our labor adventure began, someone said, “It’s a boy!” I should point out that I never had a sonogram (for lots of reasons), but my husband and I felt throughout the whole pregnancy that we were having a girl! I remember saying, “We were wrong!! !” and then never feeling so in love and relaxed in my entire life! Afterwards, we took an herbal bath with new baby Luke, and I told my husband, “I am so glad we did it this way! What a beautiful gift you gave me by bringing me to a birth center! What an amazing day this was!” Later when they were weighing Luke, I was so anxious to see if I had gotten the six and a half pound baby like we thought...9 pounds, 6 ounces—we were all STUNNED! (There are images in the video that capture this weigh check in a way that I could never describe in words!) That moment solidified why we came to All About Babies in the first place: we had a beautiful, healthy pregnancy; we had amazing emotional support from our birth family (a friend told me that she thinks of Luke’s midwives as his fairy godmothers); and I was able to birth a big healthy baby without the use of any drugs or surgical intervention, and I didn’t tear one bit! Christy, Kelli, Joni, Tonya, and Evie—thank you!! !